Antique or heirloom quilts are a treasured addition to any home and require special care to be preserved for generations to come. For newly made quilts, both hand-quilted and machine-quilted, always follow care instructions carefully. 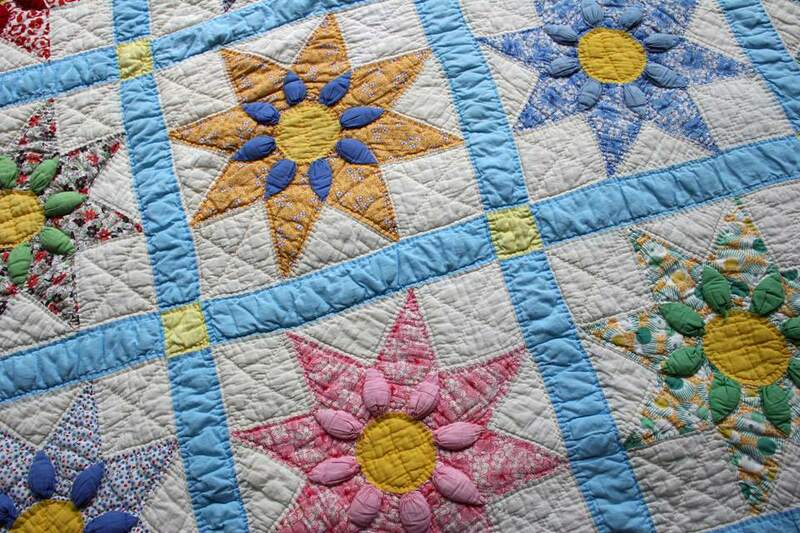 Before you clean a vintage quilt, you'll need to repair any rips or tears in the fabric. Spread the quilt out on a bed or on top of a sheet on the floor and examine carefully for any worn patches, tears, or stains. If you are a good seamstress, repair the quilt yourself by using small stitches and thread the fabric that matches the design and colors of your quilt. There are various sources of vintage or period-specific fabrics to patch your quilt or reproduction vintage fabrics can be used to replace damaged areas. If you are don’t feel qualified to do the repairs, find a reputable quilt repair service or restoration service. Your local museum is a good place to find a referral. They can restore your quilt or tell you if your quilt is damaged beyond repair and should be enjoyed as it is. Vintage quilts require special care during cleaning. Do not dry clean or machine wash an heirloom piece. Dry cleaning chemicals can permanently harm old fabrics and the agitation action of a washing machine can cause fibers to shred. Begin by airing your quilt outside on a sunny day to restore freshness. To remove dust, vacuum with a nylon stocking over the end of vacuum hose and hold the hose slightly above the top of the quilt. If the quilt has beading, embroidery, or appliqué, do not vacuum. You could damage the work. You can also remove dust by tumbling the quilt in a clothes dryer set on AIR ONLY. Do not use any heat at all. You can hand wash the quilt but if you don't feel comfortable doing it yourself, search for a qualified quilt conservation or restoration service. Ask how they will clean the quilt and their level of experience. Any cleaning done to antique fabrics could damage or destroy your quilt. Based on the monetary and personal value of the quilt, you may decide to leave it as is rather than risk destroying a priceless piece of work. If you feel that your quilt must be washed, begin by checking the fabric for colorfastness. Testing is simple; wet a cotton swab with cold water and gently rub it over each different color or fabric in the quilt. If there is any color transfer to the swab, don’t wash the quilt at all. Washing will result in discoloration and fading. If you have hard water or iron bacteria in your water source, you should use distilled water for washing the quilt. You don’t want to risk having minerals stain the fabric. To hand wash, fill a deep, laundry sink or bathtub with cold water. Be certain that the sink or tub is very clean and has no residue from cleaning agents that could cause damage to the quilt. Use a liquid detergent that is gentle and free of dyes and perfumes. A liquid detergent will disperse in the water and leave less residue on the fabric than powdered detergent. Add 1/2 cup of distilled white vinegar to the water to both brighten colors and soften the quilt. Place the quilt in the water, being certain that the entire quilt gets wet. Gently swish the quilt around in the water. Allow the quilt to remain in the water for about 10 minutes. Next, drain the wash water and fill the tub again with fresh water. Repeat draining and refilling the tub until the water and quilt are soap free. If washing the quilt did not remove all of the stains, you can remove most stains by mixing a solution of oxygen-based bleach (OxiClean, Clorox 2, Country Save Bleach, Purex 2 Color Safe Bleach) and cool water. Follow the package directions as to how much product per gallon of water. Completely submerge the quilt in the solution and allow it to soak for at least four hours. Check the stained area. If the stain is gone, rinse well, and dry. If it remains, mix a fresh solution and repeat. It may take several soakings to remove the stain but it should come out. Proper drying is key to keeping a quilt at its best. Wet quilts must be handled gently. Pulling can break seams and cause damage. The quilt will be heavy and should be dried flat. To lift the quilt from the tub, use a white sheet to create a sling. Allow the excess water to drain then place the quilt on a bed of heavy towels placed on a plastic tarp to prevent damage to floors. Cover with more towels and roll up to absorb water. Move the quilt to another bed of dry towels, spread out flat, and allow to dry. Placing a fan in the room will help to speed the process. If you have space, place a sheet on the grass outside and spread out the quilt. Cover the quilt with another clean sheet and allow it to dry. Do not dry in direct sunlight without the top sheet in place or fading can occur. Never suspend a wet quilt from a clothesline. This causes too much stress on seams and causes tearing and can displace batting. If you plan to store a freshly laundered quilt, be certain it is completely dry. Allow an extra 24 to 48 hours for drying before storing. One of the best ways to store any quilt is lying flat on an extra bed. Keeping the quilt flat will eliminate creases and wear on folds. Simply cover the quilt with a clean sheet or bedspread. If flat is not an option, store the quilt in a cotton or muslin bag or in boxes sold for archival storage. These are usually made of acid-free paper and are perfectly safe to use. However, if you are concerned about the box getting crushed, purchase a plastic storage box. The box must be made of cast polypropylene to be safe for your keepsakes. Look for the #5 within the recycling triangle or the letters “PP” to be sure that you have the correct type of box. Do not store in the attic or basement where moisture and temperature levels will fluctuate. Before you fold the quilt, use acid-free tissue paper as padding to prevent sharp creases. You can also roll the quilt around an acid-free tube and slip it in a cotton bag. If you are storing a quilt in a wooden box or dresser, wrap it in the acid-free tissue to avoid contact with the wood. Oils and acids in the wood can cause spotting and damage. Once a year, bring the quilt out of storage to air and to check for damage. Refolding will also prevent permanent creases and damage. Proper care of your beautiful quilt will ensure it will last for generations to come.